Dr. Challa is a medical oncologist with OHC whose interests include breast cancer, myeloma and lung cancer. 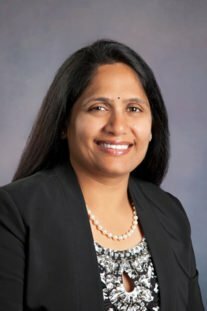 She received her medical degree at Kakatiya Medical College, Warangal, India and completed an internship and residency at Wright State University, Dayton, Ohio. Dr. Challa is board certified in medical oncology by the American Board of Internal Medicine and internal medicine by the American Board of Internal Medicine. In her free time, Dr. Challa has enjoyed supporting vaccination, health maintenance, and promotion activities with Health Camps in Warangal, India and Cancer Awareness in Hyderabad, India. Locally, Dr. Challa is involved in the community breast cancer screening awareness program at the Montgomery Reach Out Clinic in Dayton, Ohio. Dr. Challa has enjoyed supporting vaccination, health maintenance, and promotion activities with Health Camps in Warangal, India and Cancer Awareness in Hyderabad, India. Locally, Dr. Challa is involved in the community breast cancer screening awareness program at the Montgomery Reach Out Clinic in Dayton, Ohio. As a member of our OHC physician team, Dr. Challa has full access to the OHC Clinical Trial research program.